In our days, we depend too much on our Smartphones, for our work or personal lives. It is great to stay in touch with the people you love, but at what cost? The time we spend using our devices grows while the time spent with our relatives in real life is reduced. Not only that but it also consumes a huge amount of battery during the day, having to charge them every night. What can we do? 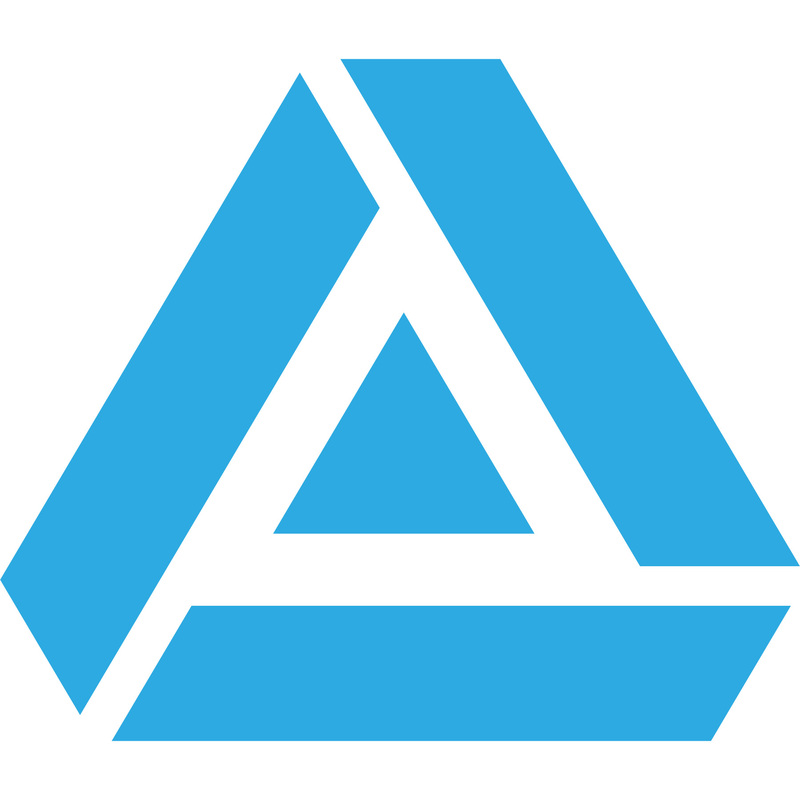 PIP or the Parallel Interactive Projector was created to lesser the dependence we have today in our Smartphones. By connecting them to the PIP device through a simple app, we can control our Smartphone through a tactile projection on the wall or through voice commands while we save precious battery and time. 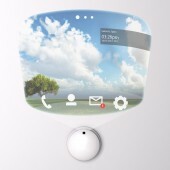 By downloading a simple and free app to your smartphone you can synchronize it with the PIP device which will automatically open and project the screen on the wall at a bigger size, but this is not all... As in any regular smartphone you can interact with the projection as if it was a tactile screen or through voice commands if you are away from the device. The project started in June 2011 and finished on September 2011 in Valencia, Spain. The PIP white case is separated in two pieces that share the same molds and are created by plastic injection. This case can be opened from the bottom to introduce and adjust to the case the led projector with sensor, infrared diode, HD cam for videoconferences, integrated microphone and speakers which surround the device covered by a cylindric fabric soft grille. A synchronizing module is installed inside as well as a rail system so the case can open and close easily when activated. 200 (diameter) x 52 mm. We searched for the best sustainable and efficient technologies in the market to integrate them in our design. 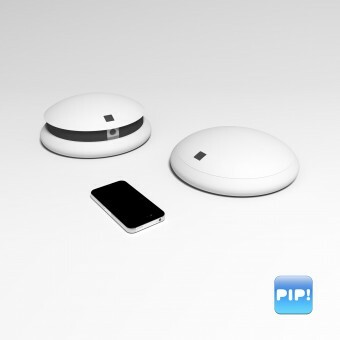 We split our research in two: the PIP device and the PIP app for Smartphones. For the PIP device we found sustainable LED projectors that projected low consume wide screens with high definition. We also found out how high was the battery consume today compared to the last years. This could be solved easily with a good screensaver created by the PIP app while the device keeps working. The hardest part was creating an interactive projection of the Smartphone screen. We searched for the best solution and at the end we decided to integrate an infrared laser under the projector which creates a thin layer over the projection. When you press any part of the projected screen and you "break" through the infrared layer, the position of your finger is sent to the PIP device which automatically activates the part pressed on your Smartphone screen and projects it in less than a second. Pip! Parallel Interactive Projector by Jorge Prieto is a Nominee in Digital and Electronic Devices Design Category. · Click here to register today inorder to be able to view the profile and other works by Jorge Prieto when results are announced. Pip! 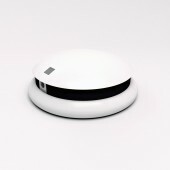 Parallel Interactive Projector by Jorge Prieto is Winner in Digital and Electronic Devices Design Category, 2012 - 2013. · Read the interview with designer Jorge Prieto for design Pip! here. · Press Members: Login or Register to request an exclusive interview with Jorge Prieto. · Click here to register inorder to view the profile and other works by Jorge Prieto. Did you like Jorge Prieto's Consumer Electronics Design? Did you like Pip! Parallel Interactive Projector? Help us create a global awareness for good consumer electronics design worldwide. Show your support for Jorge Prieto, the creator of great consumer electronics design by gifting them a nomination ticket so that we could promote more of their great consumer electronics designs.